Purple phototrophic bacteria which can store energy from light, when supplied with an electric current, can recover near to 100 percent of carbon from any type of organic waste, while generating hydrogen gas for use as fuel. 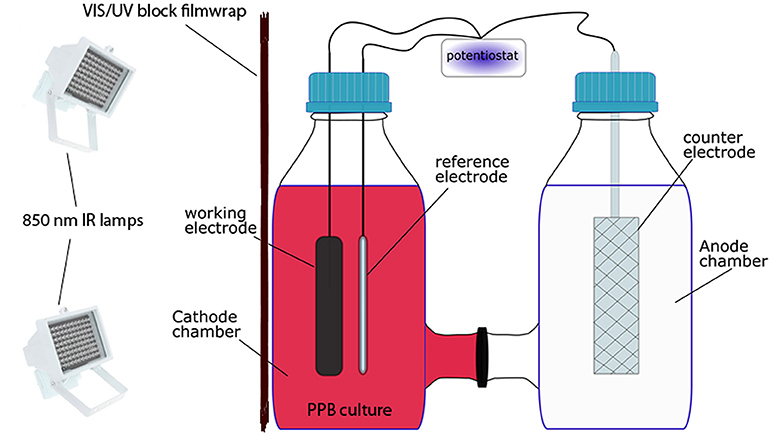 Experimental set-up of the foto-bio-electrochemical H-cell device. Image Credit: Frontiers. Click image for the largest view. Organic compounds in household sewage and industrial wastewater are a rich potential source of energy, bioplastics and even proteins for animal feed – but with no efficient extraction method, treatment plants discard them as contaminants. Now researchers have found an environmentally-friendly and cost-effective solution. The team’s paper published in Frontiers in Energy Research, is the first to show that purple phototrophic bacteria – which can store energy from light – when supplied with an electric current can recover near to 100% of carbon from any type of organic waste, while generating hydrogen gas for electricity production. When it comes to photosynthesis, green dominated the limelight. But as chlorophyll retreats from autumn foliage, it leaves behind its yellow, orange and red cousins. In fact, photosynthetic pigments come in all sorts of colors – and all sorts of organisms. Cue up purple phototrophic bacteria. They capture energy from sunlight using a variety of pigments, which turn them shades of orange, red or brown – as well as purple. But it is the versatility of their metabolism, not their color, which makes them so interesting to scientists. The bacteria can use organic molecules and nitrogen gas – instead of CO2 and H2O – to provide carbon, electrons and nitrogen for photosynthesis. This means that they grow faster than alternative phototrophic bacteria and algae, and can generate hydrogen gas, proteins or a type of biodegradable polyester as byproducts of metabolism. Which metabolic product predominates depends on the bacteria’s environmental conditions – like light intensity, temperature, and the types of organics and nutrients available. This concept, known as a “bioelectrochemical system,” works because the diverse metabolic pathways in purple bacteria are connected by a common currency: electrons. For example, a supply of electrons is required for capturing light energy, while turning nitrogen into ammonia releases excess electrons, which must be dissipated. By optimizing electron flow within the bacteria, an electric current – provided via positive and negative electrodes, as in a battery – can delimit these processes and maximize the rate of synthesis. In their latest study, the team analyzed the optimum conditions for maximizing hydrogen production by a mixture of purple phototrophic bacteria species. They also tested the effect of a negative current – that is, electrons supplied by metal electrodes in the growth medium – on the metabolic behavior of the bacteria. Their first key finding was that the nutrient blend that fed the highest rate of hydrogen production also minimized the production of CO2. “This demonstrates that purple bacteria can be used to recover valuable biofuel from organics typically found in wastewater – malic acid and sodium glutamate – with a low carbon footprint,” reported Esteve-Núñez. Even more striking were the results using electrodes, which demonstrated for the first time that purple bacteria are capable of using electrons from a negative electrode or “cathode” to capture CO2 via photosynthesis. “Recordings from our bioelectrochemical system showed a clear interaction between the purple bacteria and the electrodes: negative polarization of the electrode caused a detectable consumption of electrons, associated with a reduction in carbon dioxide production. This indicates that the purple bacteria were using electrons from the cathode to capture more carbon from organic compounds via photosynthesis, so less is released as CO2,” said Esteve-Núñez. According to the authors, this was the first reported use of mixed cultures of purple bacteria in a bioelectrochemical system – and the first demonstration of any phototroph shifting metabolism due to interaction with a cathode. Capturing excess CO2 produced by purple bacteria could be useful not only for reducing carbon emissions, but also for refining biogas from organic waste for use as fuel. However, Puyol admits that the group’s true goal lies further ahead. “One of the original aims of the study was to increase biohydrogen production by donating electrons from the cathode to purple bacteria metabolism. However, it seems that the PPB bacteria prefer to use these electrons for fixing CO2 instead of creating H2. This is progress. Lets hope a replicating scientists get on board to follow up because the potential is huge and the problem addressed is abundant. This is worthwhile work with grand results.